Each weekday before the DCI 2005 Classic Countdown, we'll be running first-person accounts of the seasons and the shows that will be featured in that event. Here's the fourth installment: By Jeremy Witherell My name is Jeremy Witherell and I was one of the drum majors for the 2000 Boston Crusaders. My first live drum corps experience was quarterfinals in 1994. I remember seeing videos playing in my high school band room prior to performances, but I had never seen a show live. Since I'm from East Lyme, Conn., only about two hours from Boston, Foxboro was easy for my family to get to, so it was the perfect time for my "introduction" to the activity. I was immediately wowed by the performances, even those of the smallest corps. I knew I had to be a part of this someday. The Boston Crusaders in 2000. After getting a brief taste of what it was like to be a Boston Crusader in 1995, I joined the corps in 1996. I couldn't really have asked for a better experience in those first few years. Though we weren't as successful in competition, the lessons I learned and experiences I had were an invaluable part of my musical education. They helped mold me and prepare me for a career teaching music. In those "early years" I also had many fantastic leaders, including Jason Maxner, who passed away tragically in a car accident a few years later, who were models for me later in my career, especially when I became drum major of the corps. 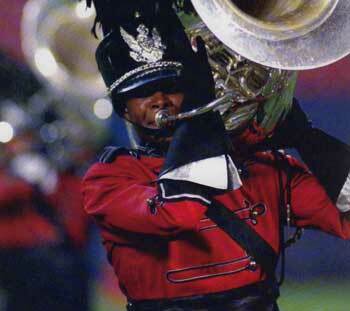 The '99 season was not just the first season the corps ever made finals; it was a season about overcoming adversity. Financial woes almost cost us a summer tour, thieves snuck into the gym during move-in and went through people's bags, stealing anything of value, and one of our buses rear-ended a truck shortly after we left the Hershey, Pa., show, leaving some members with injuries to recover from. We managed to make it though, which made the outcome of the season that much more special to everyone involved. I remember coming off the field Saturday night thinking how incredible it was that we had been able to overcome so much, and accomplish something the corps had never done before. Standing inside the stadium with tears in my eyes, embracing all my friends, many of whom had been with the corps as long or longer than I had, the feeling was indescribable. I bring up the 1999 season only to give an idea of what we were all feeling going into the 2000 season. This was our 60th anniversary, and I was honored to be named one of the drum majors, along with my friend, Tom Spataro. We knew we had a challenge ahead of us: To match the intensity and excitement built up over the course of the '99 season. We also knew that excitement would be the momentum we needed to make the 60th anniversary special. From the first camp I could tell something was different this year. While many of the members were veterans, it was as if the success of 1999 had made each individual just a little more mature, a little more professional, and a little more confident. Combine that with a drastic increase in the number and talent of people auditioning, and it was clear this would be a special year. Through the camps, as each new piece was introduced to us, the excitement kept building. I remember the familiar voice of soprano player Pedro Comacho saying, "We're gonna win!" almost every day. While on the outside everyone laughed it off, I think we were all secretly fantasizing about exactly how far we could go. It didn't start out great, however. At our first performance, which was an exhibition in Biddeford, Maine, where we had move-in that year, we were still very rusty with some of the changes, so we had to use the infamous "Dr. Beat" for the performance. We managed to clean things up drastically over the next week so that our first performance in Beverly, Mass., was one of the best first shows the corps has ever had. Still, we had a long way to go and many, many improvements to make. Standing on the podium all summer, I was amazed at what a different experience it was. Obviously I had more of a leadership role, and I got to spend more time with other sections of the corps, but more than that, I got much more of an "instructor's-eye view" of the corps as improvements were made. A lot of times when you're in the horn line you don't really notice the difference minor tweaks make, but from up front, I was astonished at how quickly things improved. It seemed like only a week into tour we had really become a completely different drum corps. One of the things that kept the summer moving so rapidly and kept things exciting is that the show kept evolving. You're always making small changes here and there, that happens every year. But in 2000, we were continually making major additions. The most drastic of these additions was the change to the end of the show. The day after the Indianapolis regional, we were in Centerville, Ohio, and as we were waiting to go onto the field, I overheard someone say, "Enjoy that ending tonight. It's gone tomorrow." We had heard rumors that the end of the show was going to be changed, but we didn't really know how, and we never expected quite so drastic a change. We stayed at the show site that night and began work on a completely rewritten ending. What we all assumed would be minor music changes actually turned out to be a redesigned final minute of the production. From the start, I think everyone agreed that the new ending was exactly what we needed to put the show over the top. While the show as a whole got tremendous crowd response, the ending had almost seemed anticlimactic. When we were learning it though, I remember looking down at the members faces and seeing just how difficult the new ending was, particularly visually. Conveyer belts at tight intervals, direction changes every couple of counts, it seemed insane. The final effect, though, was simply incredible. It was definitely exactly what the show needed. And that's really how the season went. Every change we made improved the show drastically and kept it interesting to the members. Nothing ever got old, and that's how we were able to keep our performance momentum going all the way through the end of the season. Finals week seemed to go by in a flash, and before we knew it, we were lined up outside Byrd Stadium waiting to lead off DCI's first-ever live broadcast. 2000 was one of the first years of DCI's "Top Five Live" experiment, and while it may not have lasted very long, you cannot imagine how fast our heart were pounding standing outside the stadium waiting for them to give us the cue to go on. We could hear the announcer counting down the minutes until the live broadcast, psyching up the crowd. Finally, after what seemed like forever, they gave us the cue. It was showtime. I began this article with a bit about my drum corps history, focusing on the 1999 season because I wanted to give you an idea of how incredibly honored I was to be a part of that drum corps. We had done something no other edition of the Boston Crusaders had ever done, perform on finals at DCI World Championships. While, in all honesty, that should have been the most memorable experience of my drum corps career, as it was certainly the most historic moment, I have to admit that I'm a bit partial to the feeling I had coming onto the field that night in 2000. As I look back on it now, I'm a bit embarrassed that mixed in with the incredible excitement and anticipation of the night, the other thoughts going through my mind leading up to that first downbeat had little to do with the show and were more along the lines of, "Don't trip climbing the podium in front of all these people," or, "Don't mess up the salute on live television." I'm happy to say I didn't trip, or mess up the salute, and once I heard Brandt Crocker say, "Boston Crusaders, you may take the field in competition," I was all business. I don't even remember the performance itself. What I remember is the unbelievable feeling I had afterward. It's just one of the many incredible memories that this activity and this corps have given to me; maybe that's why I can't seem to drag myself away from it. Emotions run so high at the end of a season that the staff and veterans always tell first-year members not to decide whether or not to come back for at least a month after you get home. You need that time away for the experience to truly soak everything in. And every year it does soak in -- and every year, I find my way back.